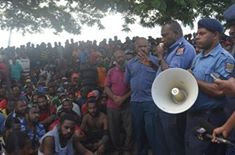 NCD Metropolitan Superintendent, Ben Turi today met with PMV bus owners advising them to do up a proper crime report for the damages done to their buses during the ethnic clash yesterday afternoon at the Gordon's Market. Turi expressed sympathy towards the owners of the buses but urged them to seek proper channels with the assistance of police to deal with the matter. Bus owners and drivers expressed their concerns and said that the Gordon's Market area is a notorious area and many lives have been lost indicating a call for ACTION by city police in ensuring safety for everyone. They said many times vendors or opportunists harass women and girls that get on their buses but they could not stand in their defense due to the fact that their buses do incur damages also. Met Sup Turi told them that police have been always present but the vendors outnumber them. He added that as a result of this he has warned the public that from now onwards he is putting a ban on vendors or informal markets at the Gordons area.